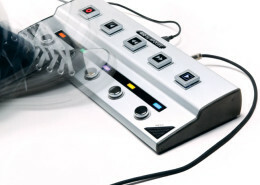 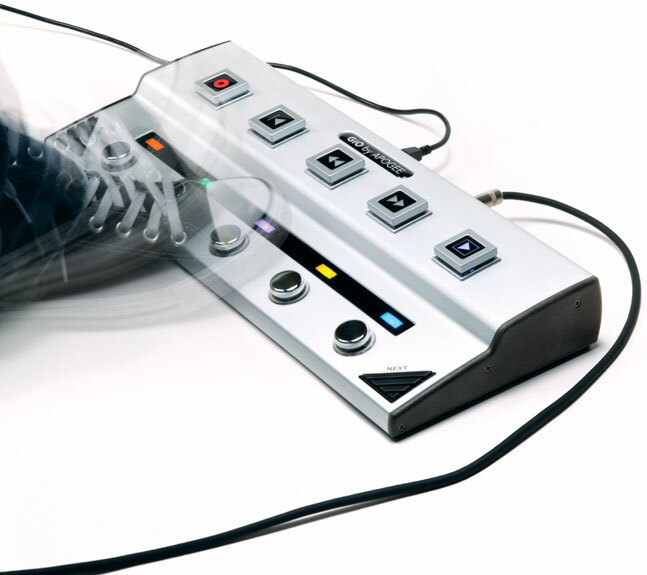 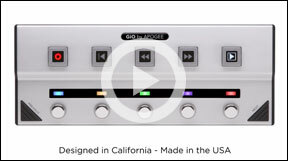 *Apogee products are built in the U.S.A. using domestic and foreign parts and components. 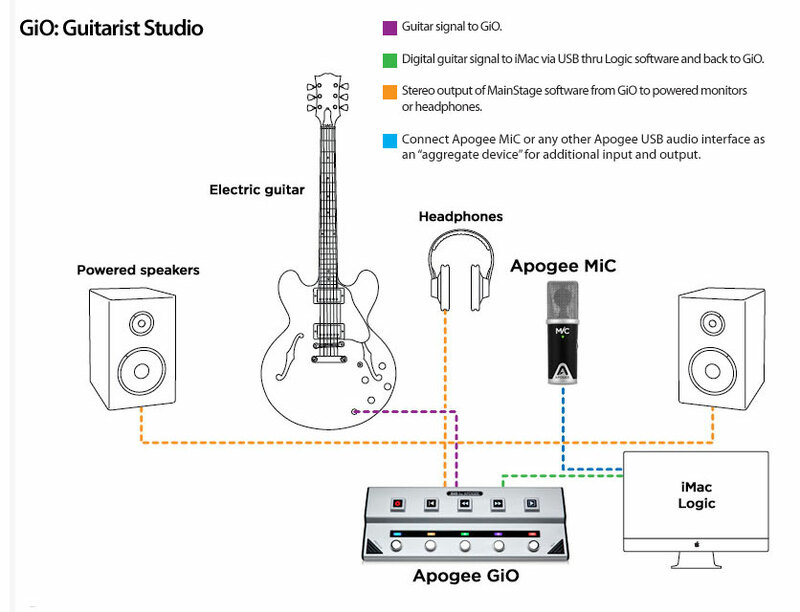 Designed to work with the new Logic and MainStage, GiO allows guitar players to control recording functions, preset changes and plug-ins like Amp Designer and Pedalboard, along with the new Playback and Loopback features in MainStage. 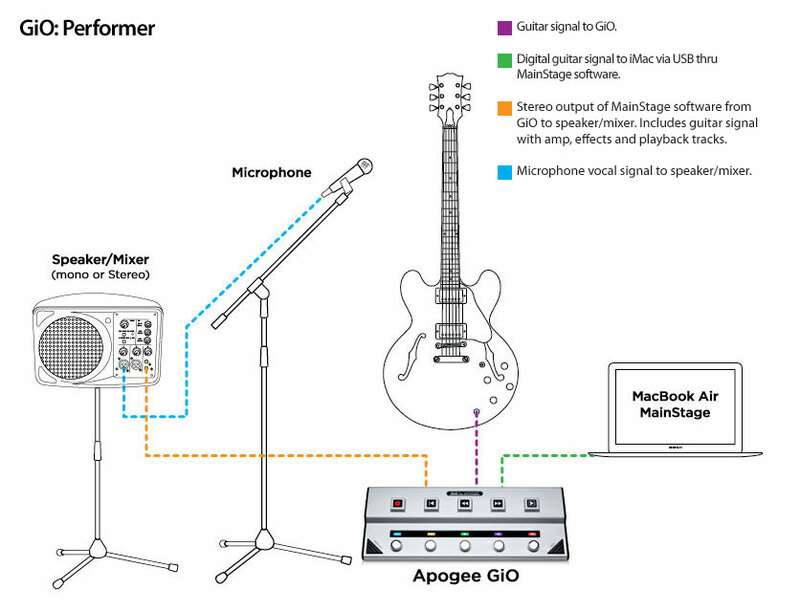 What can you do with GiO? 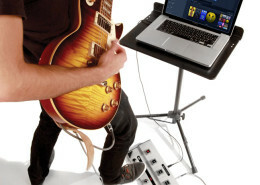 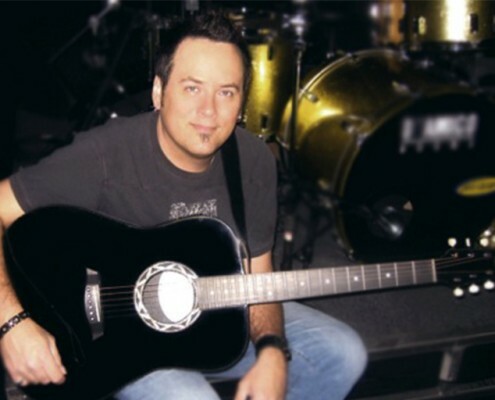 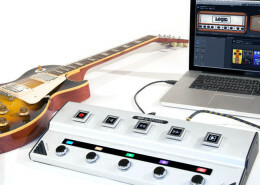 Imagine finding your sound without going back and forth from your guitar to your Mac. 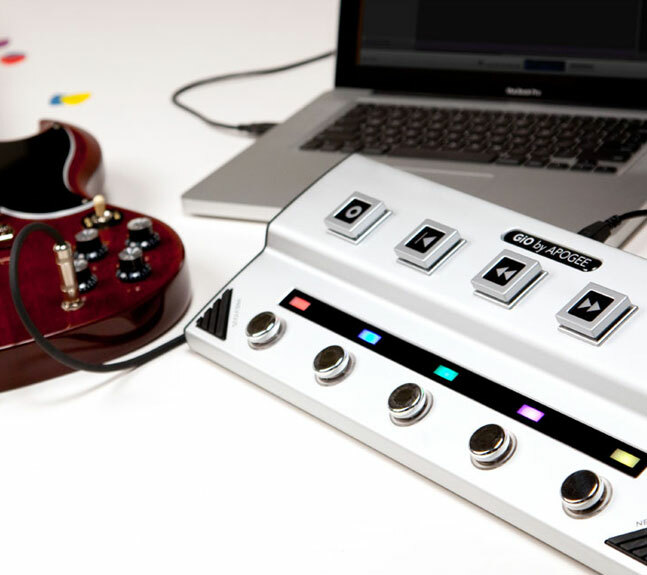 With GiO, you can audition effects presets in GarageBand, Logic and MainStage, and turn effects on and off while playing or recording… all without touching your keyboard. 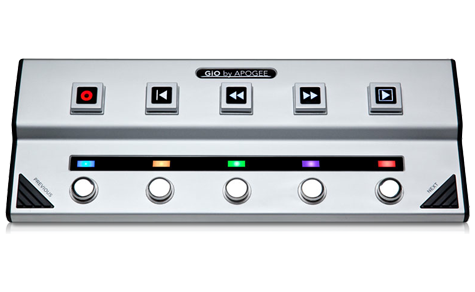 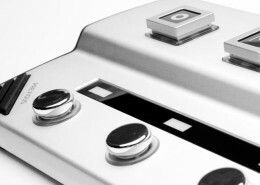 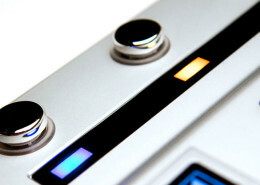 GiO’s 1/4” instrument input features Apogee’s world-class instrument preamp and converters. 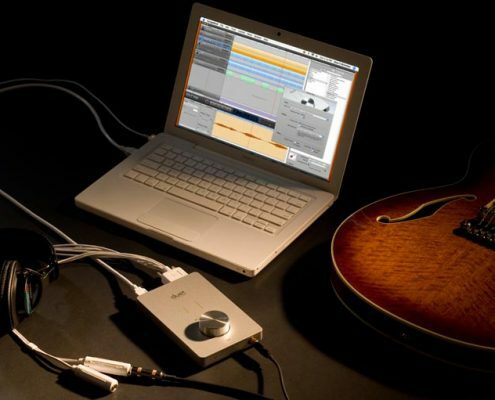 Hear and record your guitar’s true tone straight into Apple’s Logic, MainStage and GarageBand software without compromise. 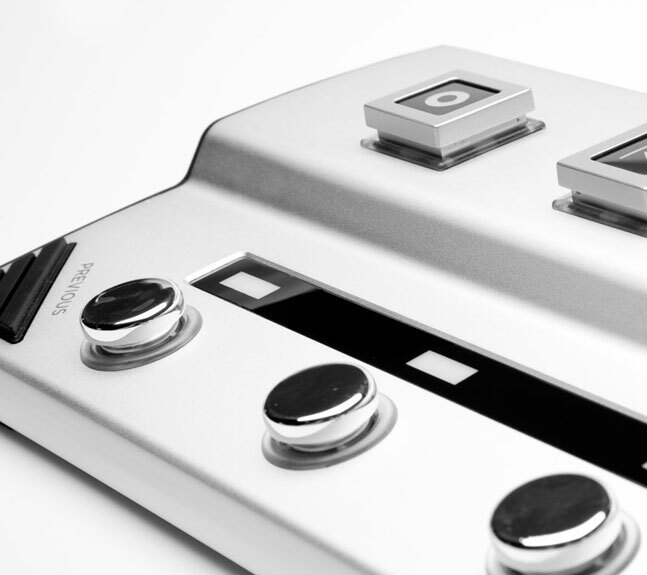 GiO is optimized for all pickup configurations from the most basic single coil to sophisticated active electronics setups. 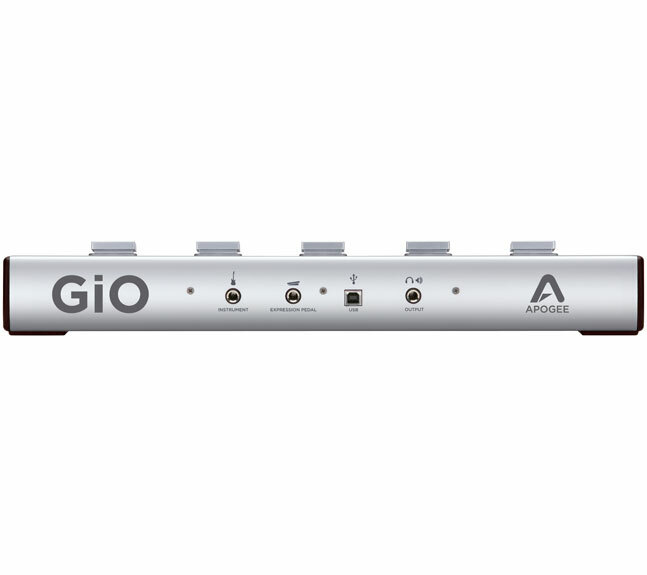 GiO frees you from key-command recording allowing you to concentrate on your performance and not the space bar. 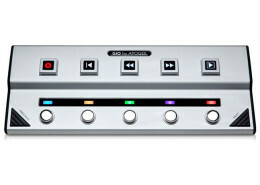 The five transport buttons on GiO let you record, play, stop and quickly navigate thru your track without taking your hands off the neck of your guitar. 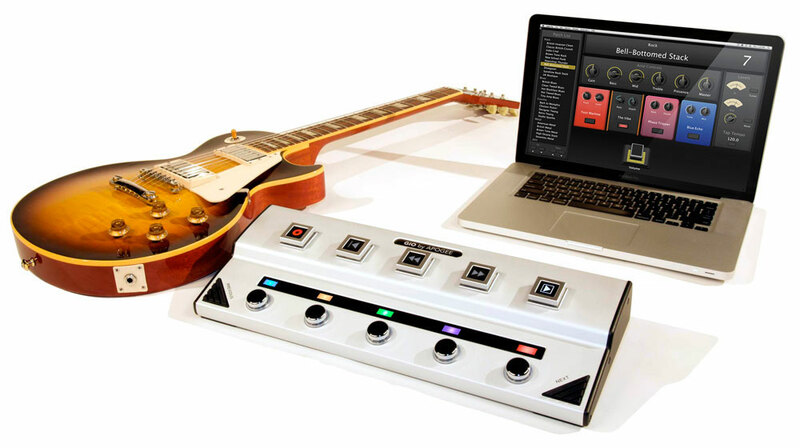 Previous and Next preset select buttons let you quickly audition and toggle between guitar amps and effects presets in Logic and GarageBand and the patch lists in MainStage. 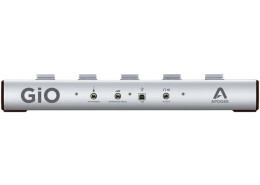 GiO is fully powered by the USB connection to your Mac eliminating the need for an external power source. 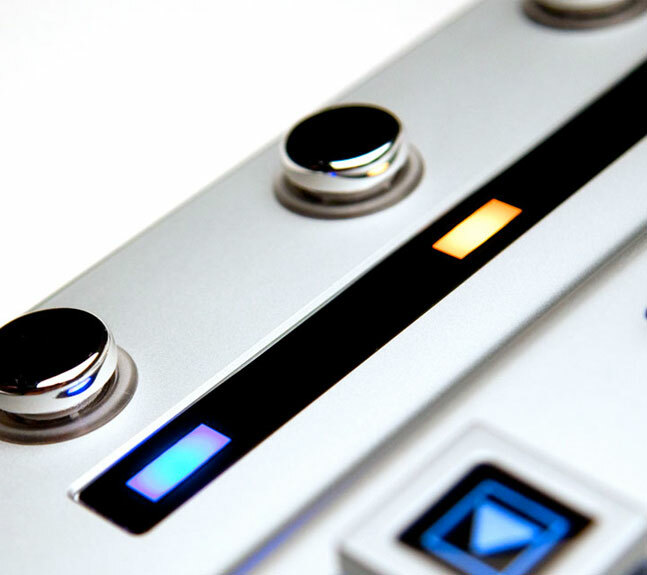 Simply plug into an available USB port on any Mac and you’re ready to go. 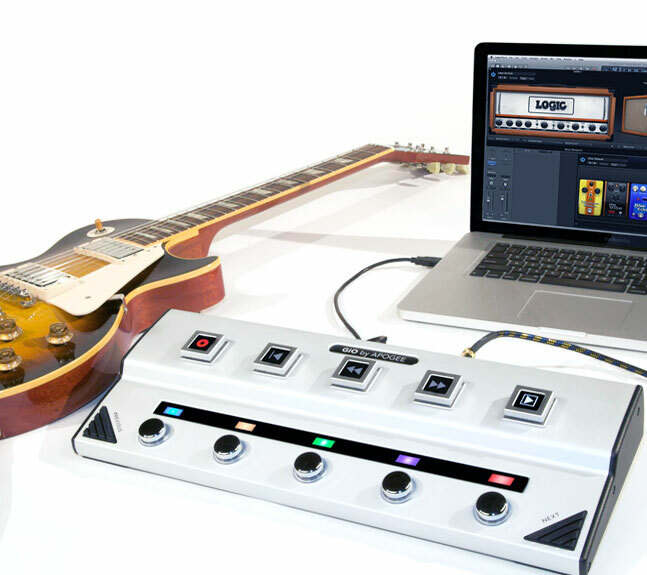 Hear your guitar and recording like never before. 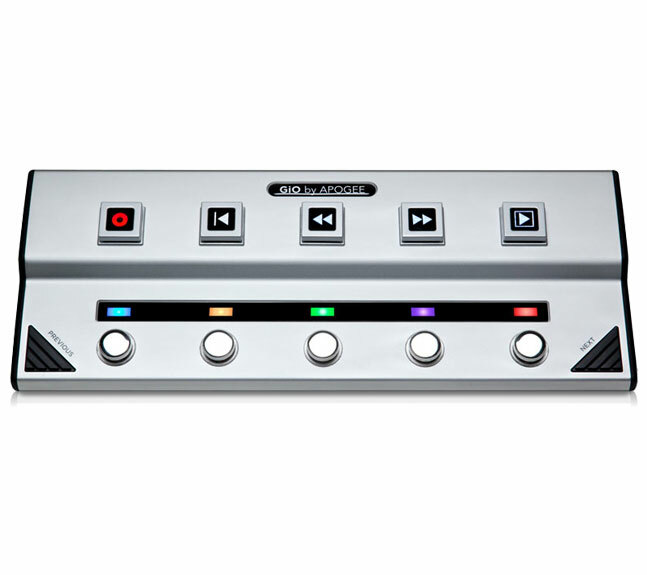 Connect your headphones, powered monitors or instrument amplifier to Apogee converters via GiO’s 1/4” stereo output and listen to your guitar and mix with incredible clarity and dimension. 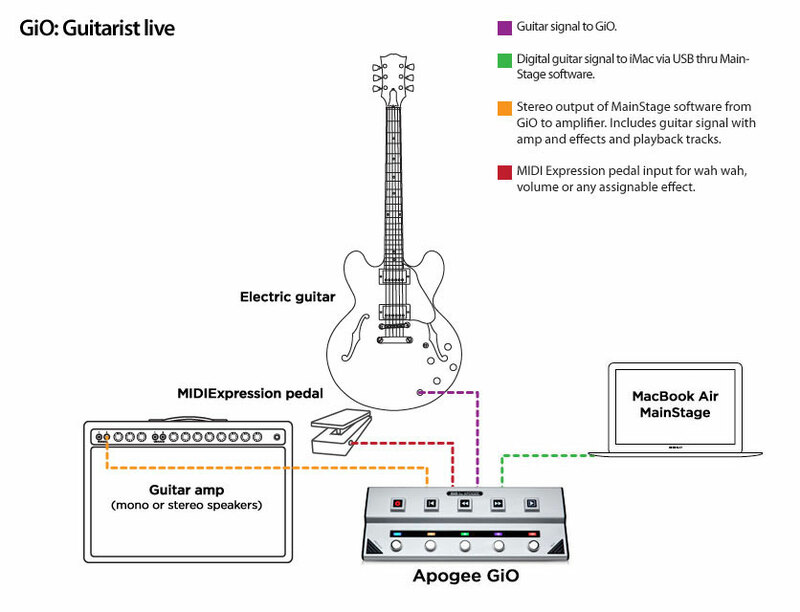 "It was a joy to work Logic using GiO, as well as to perform onstage with the controller, a Mac- Book Pro, one guitar, and two cables—which all fit into a large gig bag." 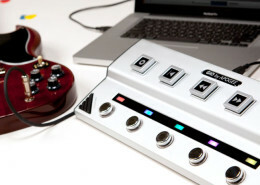 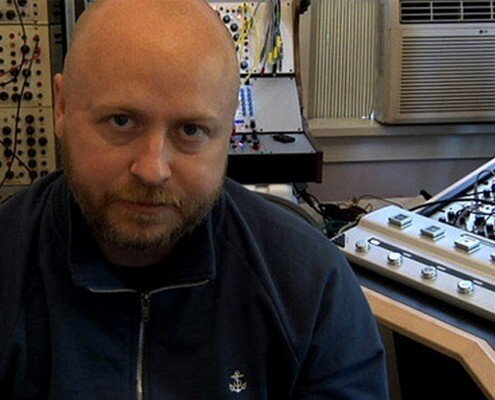 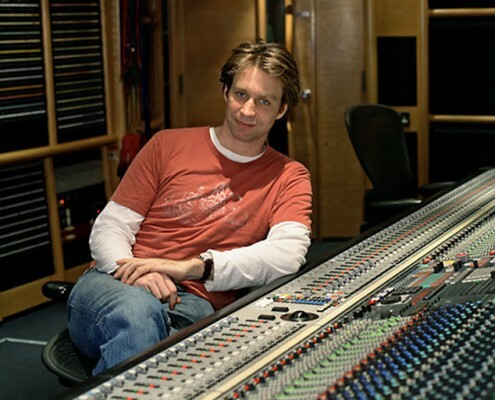 "...helps keep your mind on the music instead of the engineering. 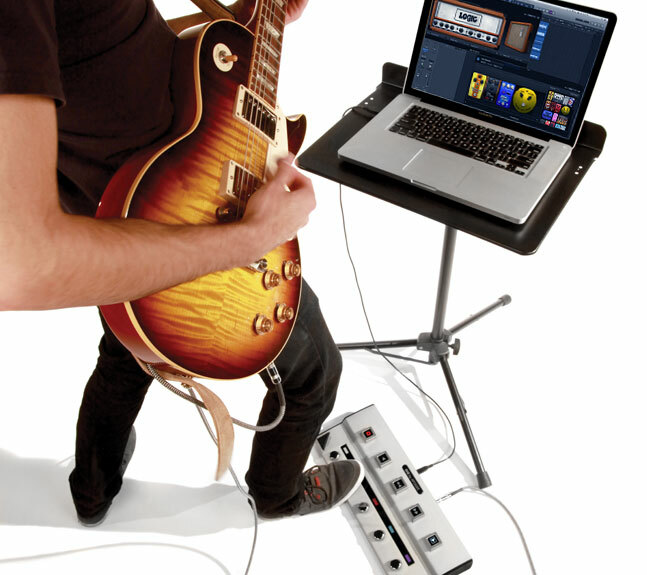 For those using Logic and Mainstage 2 in live performance, having a pedalboard like this is almost a necessity." 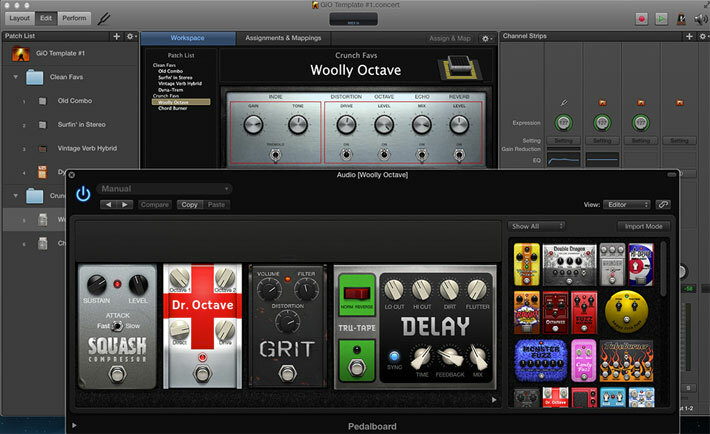 "It provides fuss-free control over things guitarists want when laying tracks in Logic or GarageBand."